I was similar to the casual listener at one time. I never put much stock into any of the myths or crazy stories folks told about musicians and the blues. I had lived hard and fast, and I had found no supernatural demon outside of myself. To look at him is not much. Medium height. A nice enough demeanor. I know I was certainly not blown away by his greatness. Not yet anyway. A heavy shot of fast-paced blues harmonica in front of over one hundred happy, young people at Rock Springs Nature Center was my introduction. 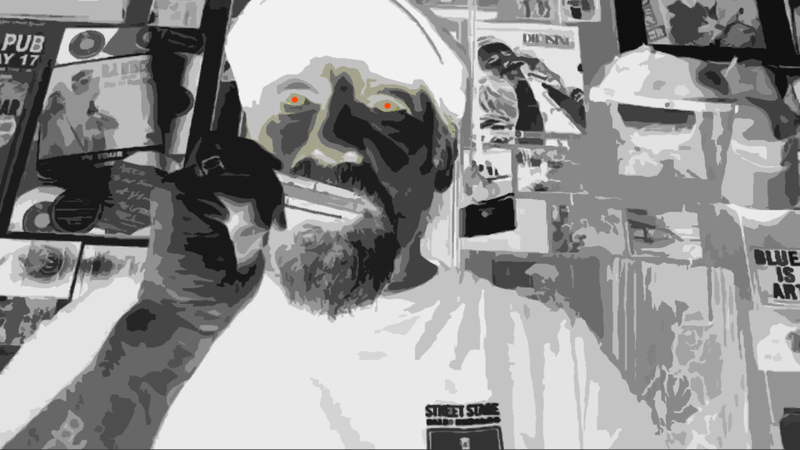 There was only one man on stage, a harmonica virtuoso named Deak Harp who claimed to hail from Oakland, California. I would later learn of his origins on the opposite coast, but he managed to make it sound as if someone had flown in a full band from the Mississippi Delta. Playing his custom-built harmonicas, attached to a cradle around his neck, he strummed--what he called--one of his diddley-beast guitars. I later learned that he crafted all his own instruments with his own hands--the tough, worn hands of a carpenter, a vocation given up long ago for a life on the road. The instrument was made from a cigar box and a broom handle with built-in electrical amplification. 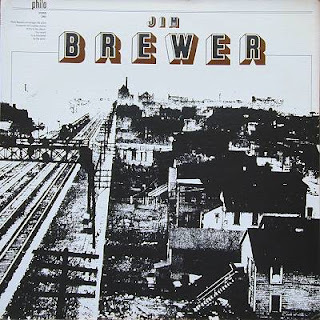 His flying feet worked a base drum setup and stamped rhythm on a wine crate with an internal microphone. The three-string diddley bow and the percussion provided a soaring, hard-driving backdrop to the harmonica, which he could play with astonishing speed and even turn into the sounds of a horn-blowing freight train, pounding across the prairie. "It's hard to explain, but when I play the blues, I feel good," Harp exclaimed, having been playing music for almost 40 years. "There's mechanical music, and there is music that comes from your soul. With the blues, you can really feel it." His audience certainly did, clapping along with his strumming and enjoying lyrics about everything from the agonies of musicians forced to live in their cars to the need to down a beverage at the local watering hole. Though he told his audience that the blues had its origins in the Jim Crow South at the turn of the century, his music was from somewhere else. 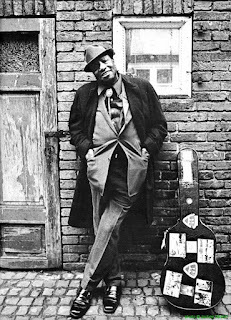 After all, according to Willie Dixon "not everybody's blues is the same." 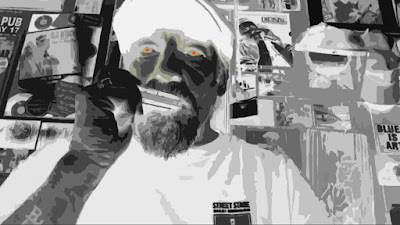 Deak was born and raised in New Jersey, far from the bay area and the Mississippi Delta. At the tender age of twelve, a young Deak Harp had realized his life was meant for more than offered on the boardwalks of New Jersey. He spent most of the next several years learning, training, bleeding, giving his all to his musicianship craft. His biggest early inspiration came when his brother introduced him to the music of James "Superharp" Cotton, who Deak subsequently followed up and down the east coast for close to five years. 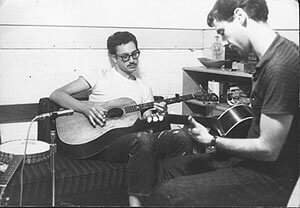 Cotton eventually offered the young turk a job driving his van, but no matter how long and hard he practiced, the aspiring musician never quite felt the peak of human potential was reached. Deak was correct. He was a bit depressed too, but he was willing to put all on the line to reach the pinnacle of dextrous perfection. On the advice of locals, he decided to visit the southern New Jersey town of Leeds Point, where a supernatural being had supposedly setup in the nearby Pine Barrens. Having been scorned by its mother and transformed into a blood-curdling creature, it was said to possess great powers. It led a charmed life, according to one story. Despite being hunted for years and shot several times with silver bullets, it roamed the forests and doled out dark favors to those who crossed its path. 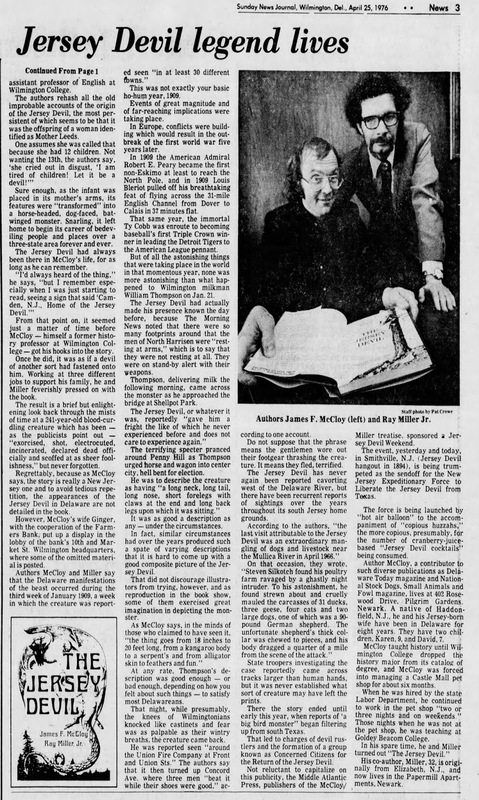 the supernatural figure; "Jersey Boasts its Own Devil,"
The (Wilmington, DE) Morning News, April 25, 1976. Several members of WeenieCampbell.com have expressed their sadness over the lack of information available about Belton Sutherland. 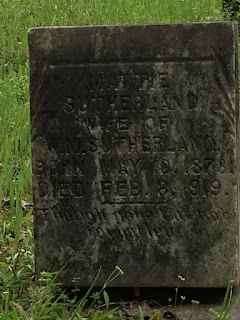 One member, for example, states, "I wish there was more info out there on Belton Sutherland." 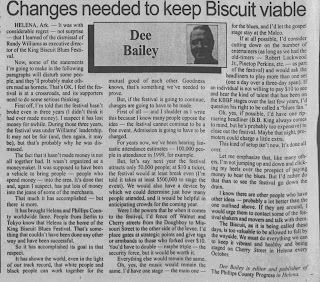 Another contributor admits, "He is filmed performing two fine songs in Canton, Mississippi, but nothing else is said about him. His songs are quite good. Wish there was more of him." 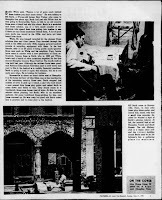 Yet another contends that he may have only “recorded three songs, but they were powerful." Michael Cardenas asserts that the Land Where the Blues Began is a "Crucial DVD and Belton steals it." 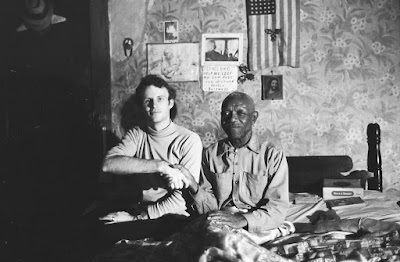 One of the newer members of the site writes, "I don't know how 'obscure' this bluesman is, but...[h]e only recorded 3 songs with Alan Lomax & all 3 were very raw, incredibly powerful songs. 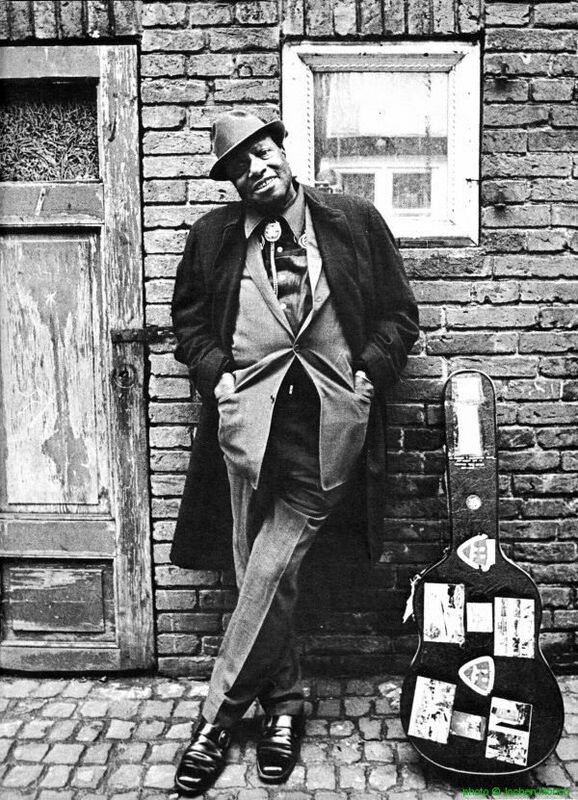 He looks & sounds like a man who has lived the blues his entire life." Belton Sutherland was born on February 14, 1911--the same year as Robert Johnson came into the world of Jim Crow, Mississippi. 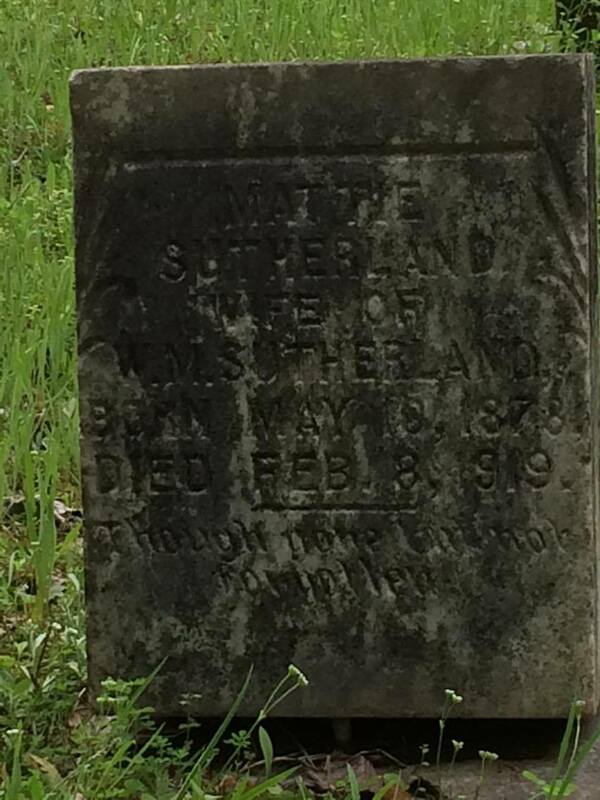 His parents, William and Mattie Sutherland, already had eight children, and they would have four more after Belton, making a total of thirteen. 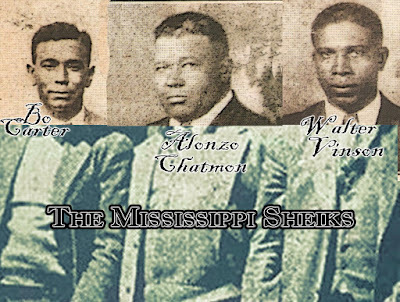 The Sutherland family worked as sharecroppers in the small hamlet of Camden, Mississippi, not too far from St. John M.B. Church. In fact, Belton lost his mother shortly before his eighth birthday, and her grave is located behind the church. His mother's grave was marked following her death with a modest, yet very respectful, headstone. While he loses his mother before a census enumerator ever writes his name in the 1920 Census, he would grow up quick as a motherless child, get married to woman named Louise, and move to Holmes County by the time his name name is again put to parchment for the federal government in 1930. 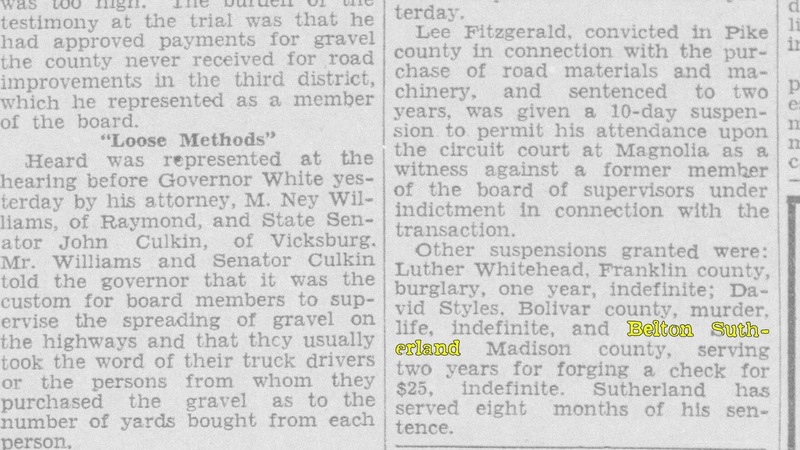 Clarion Ledger, March 10, 1937. 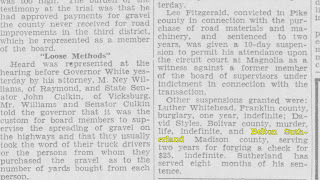 It remains unclear what events transpire over the next seven years, but in the late 1930s, Belton had moved back to Madison County, where he gets arrested for forging a $25 check. The judge sentenced him to two years on the state prison farm at Parchman. After serving only eight months, however, the remainder of his sentence got suspended by the governor. Not yet thirty years-old but the future show-stealer already knew how it feels to be a motherless child and to get convicted of forgery despite one census enumerator noting that he never had the opportunity to pickup reading and writing, at least not in his young life. HELENA, Ark. 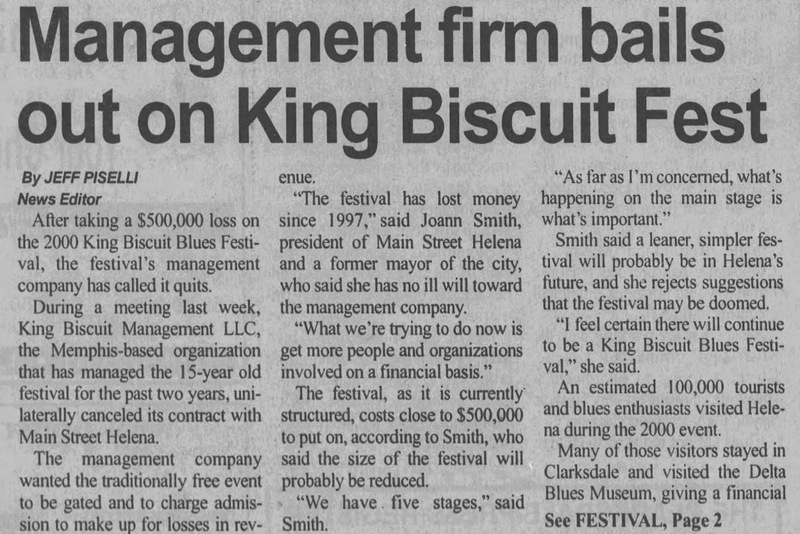 — It was with considerable regret — not surprise that I learned of the dismissal of Randy Williams as executive director of the King Biscuit Blues Festival. Now, some of the statements I'm going to make in the following paragraphs will disturb some people, and they'll probably make others mad as hornets. That's OK. I feel the festival is at a crossroads, and its supporters need to do some serious thinking. First off, I'm told that the festival hasn't broke even in three years (I didn't think it had ever made money). I suspect it has lost money for awhile. During those three years, the festival was under Williams' leadership. It may not be fair (and, then again, it may be), but that's probably why he was dismissed. The fact that it hasn't made money is not all together bad. It wasn't organized as a moneymaker. It was supposed to have been a vehicle to bring people — people who spend money — into the area. It's done that and, again I suspect, has put lots of money into the jeans of some of the merchants. That much it has accomplished — but there is more. 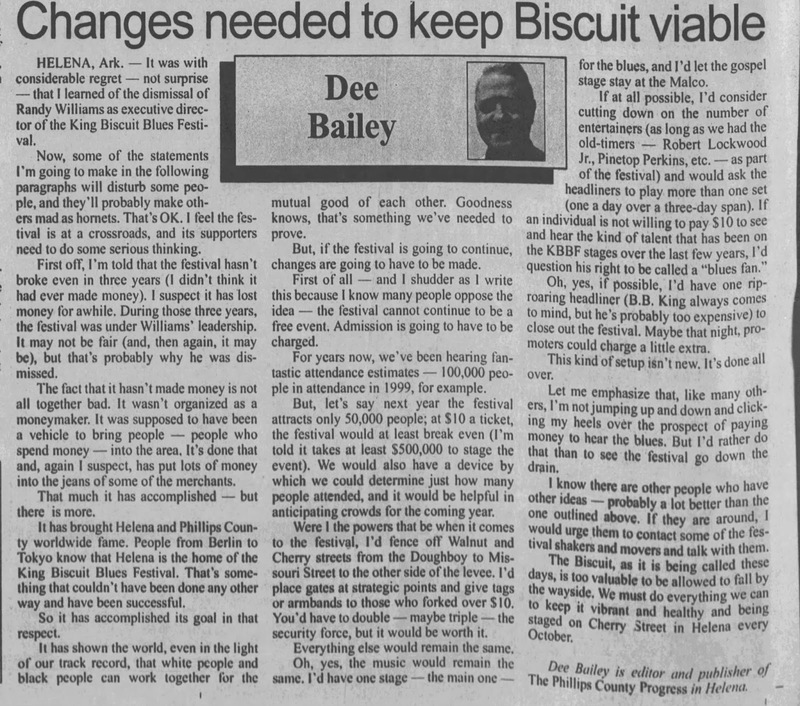 It has brought Helena and Phillips County worldwide fame. 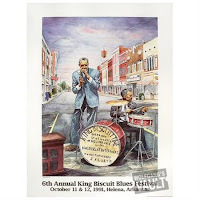 People from Berlin to Tokyo know that Helena is the home of the King Biscuit Blues Festival. That's some-thing that couldn't have been done any other way and have been successful. So it has accomplished its goal in that respect. It has shown the world, even in the light of our track record, that white people and black people can work together for the mutual good of each other. Goodness knows, that's something we've needed to prove. But, if the festival is going to continue, changes are going to have to be made. First of all — and I shudder as I write this because I know many people oppose the idea — the festival cannot continue to be a free event. Admission is going to have to be charged. For years now, we've been hearing fan-tastic attendance estimates — 100,000 people in attendance in 1999, for example. But, let's say next year the festival attracts only 50,000 people; at $10 a ticket the festival would at least break even (I'm told it takes at least $500,000 to stage the event). We would also have a device by which we could determine just how many people attended, and it would be helpful in anticipating crowds for the coming year. Were I the powers that be when it comes to the festival, I'd fence off Walnut and Cherry streets from the Doughboy to Missouri Street to the other side oldie levee. I'd place gates at strategic points and give tags or or armbands to those who forked over $10. You'd have to double —maybe triple — the security force, but it would be worth it. Everything else would remain the same. Oh, yes, the music would remain the same. I'd have one stage - the main one for the blues, and I'd let the gospel stage stay at the Malco. If at all possible, I'd consider cutting down on the number of entertainers (as long as we had the old-timers — Robert Lockwood Jr., Pinetop Perkins, etc. — as part of the festival) and would ask the headliners to play more than one set (one a day over a three-day span). 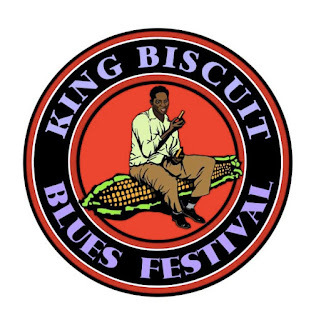 If an individual is not willing to pay $10 to see and hear the kind of talent that has been on the KBBF stages over the last few years, I'd question his right to be called a "blues fan." Oh, yes, if possible, I'd have one rip-roaring headliner (BB. King always comes to mind, but he's probably too expensive) to close out the festival. Maybe that night, promoters could charge a little extra. This kind of setup isn't new. It's done all over. Let me emphasize that, like many others, I'm not jumping up and down and clicking my heels over the prospect of paying money to hear the blues. But I'd rather do that than to see the festival go down the drain. I know there are other people who have other ideas — probably a lot better than the one outlined above. If they are around., I would urge them to contact some of the festival shakers and movers and talk with them. The Biscuit, as it is being called these I'd days, is too valuable to be allowed to full by the wayside. We must do everything we can to keep it vibrant and healthy and being staged on Cherry Street in Helena every October. As long as there has been heartache, working people, children and good ole corn whiskey, it seems that blues music has been in existence. It's an art that knows only tradition and feeling. 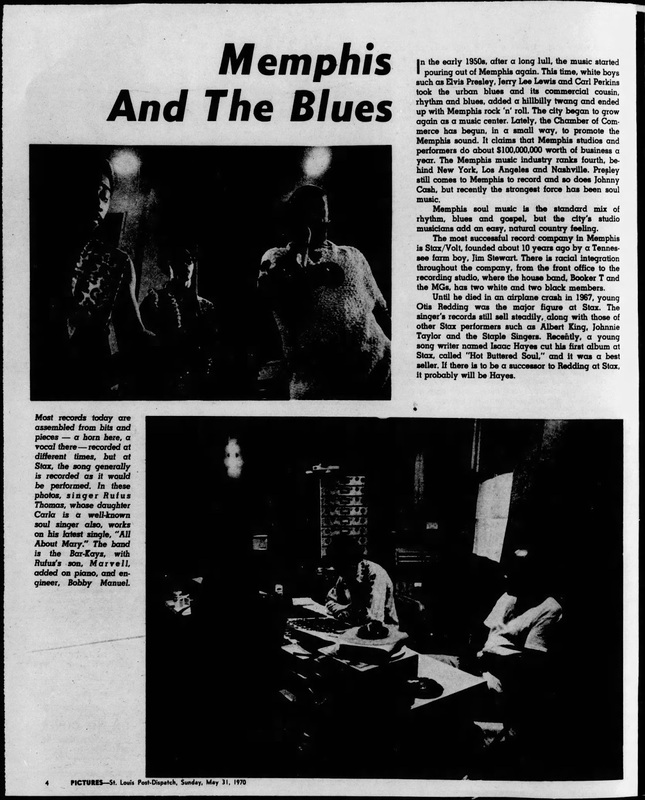 Sitting on a stool in the Blue Front Cafe located by the railroad tracks in Bentonia, Jimmy Holmes takes a puff on his cigarette and tells how the blues has become important to him, to others and to Black culture. Holmes talks candidly about how he has researched the history of the blues, particularly in the Bentonia area and how the music continues to survive. 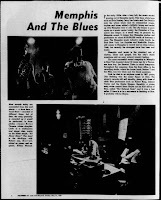 "Blues is a feeling," he explains. "It is a form of music that ex-presses life whether it's good or bad. If a guy's ole lady has left him, if he's not working or somebody has stolen his lady he sets down with his guitar and begins putting words together. To appreciate the blues, you've got to live it." 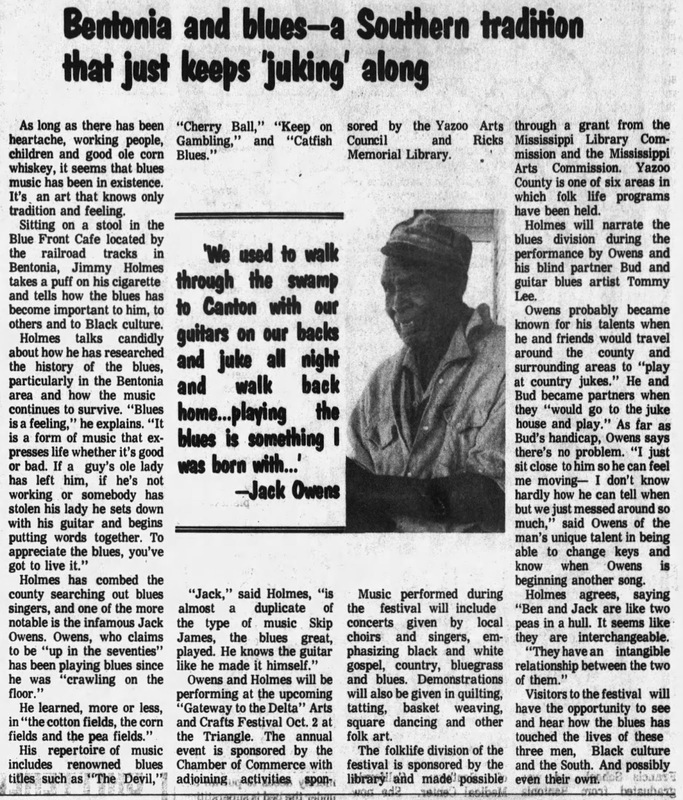 Holmes has combed the county searching out blues singers, and one of the more notable is the infamous Jack Owens. Owens, who claims to be "up in the seventies" has been playing blues since he was "crawling on the floor." He learned, more or less, in "the cotton fields, the corn fields and the pea fields." His repertoire of music includes renowned blues titles such as "The Devil," "Cherry Ball," "Keep on Gambling," and "Catfish Blues." "Jack," said Holmes, "is almost a duplicate of the type of music Skip James, the blues great, played. He knows the guitar like he made it himself." Owens and Holmes will be performing at the upcoming "Gateway to the Delta" Arts and Crafts Festival Oct. 2 at the Triangle. The annual event is sponsored by the Chamber of Commerce with adjoining activities sponsored by the Yazoo Arts Council and Ricks Memorial Library. Music performed during the festival will include concerts given by local choirs and singers, emphasizing black and white gospel, country, bluegrass and blues. Demonstrations will also be given in quilting, tatting, basket weaving, square dancing and other folk art. The folklife division of the festival is sponsored by the library and made possible through a grant from the Mississippi Library Commission and the Mississippi Arts Commission. Yazoo County is one of six areas in which folk life programs have been held. Holmes will narrate the blues division during the performance by Owens and his blind partner Bud and guitar blues artist Tommy Lee. Owens probably became known for his talents when he and friends would travel around the county and surrounding areas to "play at country jukes." He and Bud became partners when they "would go to the juke house and play." As far as Bud's handicap, Owens says there's no problem. "I just sit close to him so he can feel me moving— I don't know hardly how he can tell when but we just messed around so much," said Owens of the man's unique talent in being able to change keys and know when Owens is beginning another song. Holmes agrees, saying "Ben and Jack are like two peas in a hull. It seems like they are interchangeable. "They have an intangible relationship between the two of them." Visitors to the festival will have the opportunity to see and hear how the blues has touched the lives of these three men, Black culture and the South. And possibly even their own. "My right name is Walter Lewis," the elderly black man explained, "But I always go by Furry. I guess I started playing the guitar when I was just about 10 years old, and I'm 81 now. "I didn't call myself a professional in them days. I still don't call myself a professional, but you can put it like this: They call me a rabbit in a thicket, and it takes a good dog to catch me with a guitar." His face crinkled into a broad grin, and behind his thick glasses the dark eyes twinkled. At 81 — give or take a few years — Furry Lewis is having the time of his life. Due to the revival of interest in the blues on U.S. college campuses, Lewis is financially secure for the first time in his long career. He's one of the stars of the Memphis Blues Caravan, a touring show that plays one-night stands in college towns and big cities, and he's sufficiently well-known to get occasional solo bookings in clubs like the University of Minnesota's Whole Coffeehouse, where he's scheduled to per-form Friday and Saturday evenings. Lewis hates to fly, but he loves to travel. He enjoys the luxury of hotel rooms, the good whiskey he can afford these days, and the attention he receives from audiences, the press and the younger members of the blues caravan. In Minneapolis recently before a blues caravan appearance in Northfield, Lewis was in an expansive mood. He spun out one anecdote after another about his early days with W. C. Handy's band and the great blues musicians with whom he's performed. "I'm making more now than I ever made in my life," he said. "When I was growing up, you used to get two loaves of bread for a nickel, but the trouble was, where was you gonna get the nickel?" He recalled the old days in Memphis, his home for the last 75 years, as "tough times." "We used to play all night for $3 apiece, plus all we could eat and drink. Now I wouldn't tune my guitar for $3." Lewis acknowledges that he has "a little money in the bank" as a hedge against possible future retirement. But now that he's finally earning enough to live comfortably, he takes a certain pleasure from professing poverty and regretting his failure to save any money when he was younger. "I could have been rich," he declared, "but 1 never did think of it till I got old and about ready to die. It was my mistake. I didn't have enough sense to know I would be down. Now I know: I been down so long it seems like up to me." Lewis remembers with pride his association with Handy ("he gave me the best guitar I ever had in my life") and can vividly recall the 1916 acci-dent that cost him part of his right leg. "I had $100 in my pocket, but I'm a hobo trying to save my money and hopping a freight." The veteran bluesman has never married. "I don't see no need," he explained. "What do I need with a wife when the man next door got one?" As the senior member of the blues caravan — and the oldest practicing blues musician in the world — Lewis takes his share of kidding from his younger colleagues, who have their own nickname for him: Blind, Crippled and Crazy. But Minneapolis promoter Arne Brogger, who organized and manages the caravan, says Lewis is "an old fox." "He's sharp as a tack," Brogger declared. "He doesn't miss a thing. And he's the darling of the caravan. Every-one takes care of him, and he relishes that. He's perfectly capable of taking care of himself, of course, but he doesn't want anybody to know that." Lewis doesn't deny these things, but prefers to emphasize that he's getting along in years. "I'm thinking on retiring," he admitted. "But you'd be surprised how many people say, 'Don't retire! Don't retire!' By the time you been doing something 70 years, though, you get. tired. Maybe it's time to look up in-stead of looking down." For the moment, however, Lewis doesn't intend to retire. There's no reason to slow down. "I got better health than the man at the hoard of health," he explained. The blues did not come from Memphis, but they arrived there early and have not left. 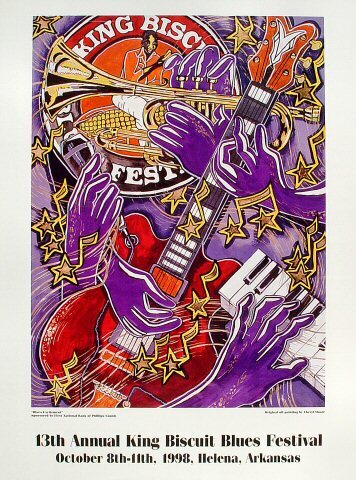 There is no city with a place in the history of the blues comparable to that of New Orleans in the history of jazz. However, Memphis is, quite probably, the most important city in the development of the blues and its offspring. The tradition is still alive in Memphis, whether in the country blues of 107-year-old guitarist Nathan Beauregard or in the best-selling soul music of young singer-composer Isaac Hayes. Memphis is a few miles north of the Mississippi state line. The city, which sits on bluffs on the east bank of the Mississippi River, is the northern limit and major urban center of the Mississippi Delta, a 200-mile-long area of rich lowland lying between the Mississippi and Yazoo Rivers. The cotton plantations and farming towns of the Delta were a major source—perhaps the source—of the country blues, a music with its roots in the work songs and field hollers of the slaves but with a variety of other influences. W. C. Handy first heard the blues in 1903, in the Delta. After the Civil War, freed slaves began moving north to Memphis. 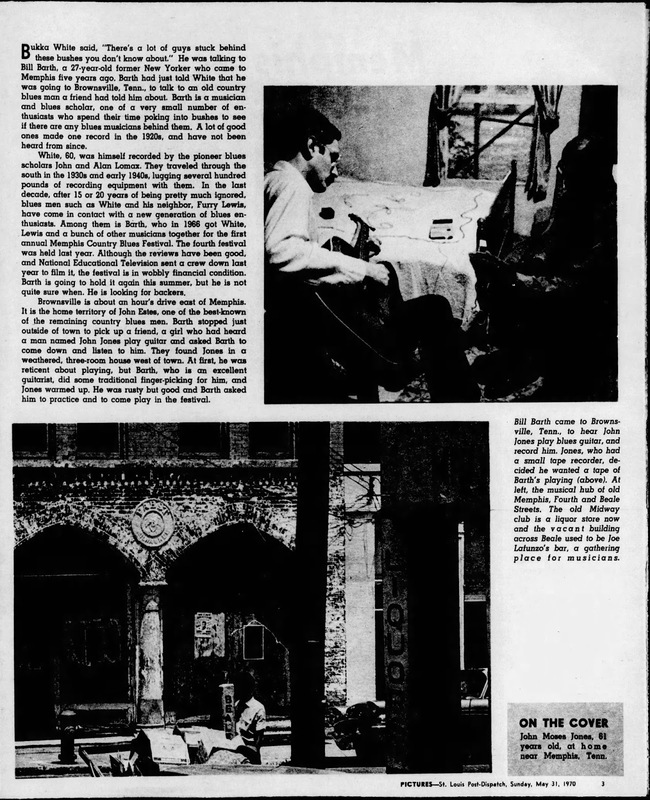 The city, like other river towns, became a free-wheeling center of entertainment and there was work for musicians along Beale Street, the center of the black district, and in the outlying roadhouses. In 1912, Handy, living in Memphis, published "The Memphis Blues," the first of 60-odd blues credited to the well-educated bandleader. By then, Memphis was the focus of a rich strain of music growing from the cross-fertilization of the primitive country-blues men and the trained band musicians. Bukka White said, "There's a lot of guys stuck behind these bushes you don't know about." He was talking to Bill Barth, a 27-year-old former New Yorker who came to Memphis five years ago. Barth had just told White that he was going to Brownsville, Tenn., to talk to an old country blues man a friend had told him about. Barth is a musician and blues scholar, one of a very small number of enthusiasts who spend their time poking into bushes to see if there are any blues musicians behind them. A lot of good ones made one record in the 1920s, and have not been heard from since. White, 60, was himself recorded by the pioneer blues scholars John and Alan Lomax. They traveled through the south in the 1930s and early 1940s, lugging several hundred pounds of recording equipment with them. In the last decade, after 15 or 20 years of being pretty much ignored, blues men such as White and his neighbor, Furry Lewis, have come in contact with a new generation of blues enthusiasts. 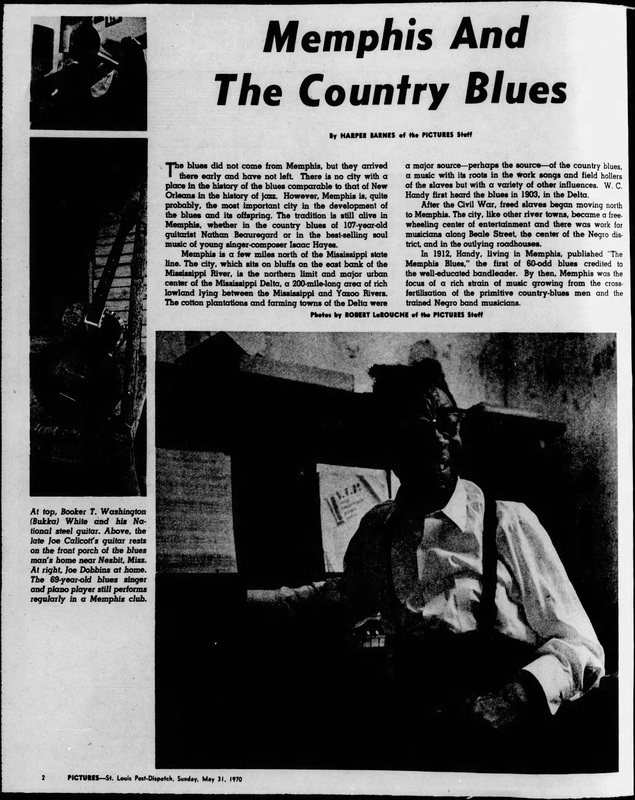 Among them is Barth, who in 1966 got White, Lewis and a bunch of other musicians together for the first annual Memphis Country Blues Festival. The fourth festival was held last year. Although the reviews have been good, and National Educational Television sent a crew down last year to film it, the festival is in wobbly financial condition. Barth is going to hold it again this summer, but he is not quite sure when. He is looking for backers. Brownsville is about an hour's drive east of Memphis. It is the home territory of John Estes, one of the best-known of the remaining country blues men. Barth stopped just outside of town to pick up a friend, a girl who had heard a man named John Jones play guitar and asked Barth to come down and listen to him. They found Jones in a weathered, three-room house west of town. At first, he was reticent about playing, but Barth, who is an excellent guitarist, did some traditional finger-picking for him, and Jones warmed up. He was rusty but good and Barth asked him to practice and to come play in the festival. 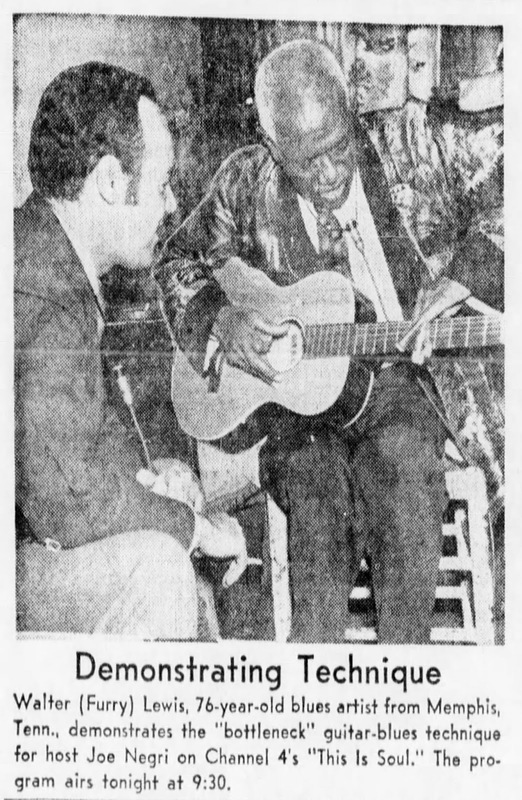 Bill Barth came to Brownsville, Tenn., to hear John Jones play blues guitar, and record him. Jones, who had a small tape recorder, decided he wanted a tape of Barth's playing (above). At left, the musical hub of old Memphis, Fourth and Beale Streets. The old Midway club is a liquor store now and the vacant building across Beale used to be Joe Lafunzo's bar, a gathering place for musicians. Most records today are assembled from bits and pieces — a horn here, a vocal there — recorded at different times, but at Stax, the song generally is recorded as it would be performed. In these photos, singer Rufus Thomas, whose daughter Carla is a well-known soul singer also, works on his latest single, "All About Mary." The band is the Bar-trays, with Rufus's son, Marvell, added on piano, and engineer, Bobby Manuel. In the early 1950s, after a long lull, the music started pouring out of Memphis again. This time, white boys such as Elvis Presley, Jerry Lee Lewis and Carl Perkins took the urban blues and its commercial cousin, rhythm and blues, added a hillbilly twang and ended up with Memphis rock 'n' roll. The city began to grow again as a music center. 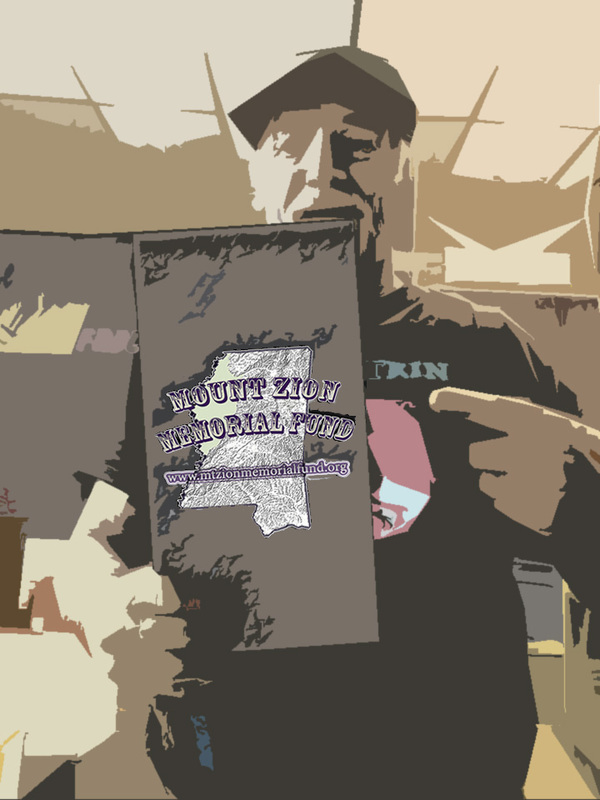 Lately, the Chamber of Commerce has begun, in a small way, to promote the Memphis sound. It claims that Memphis studios and performers do about $100,000,000 worth of business a year. The Memphis music industry ranks fourth, behind New York, Los Angeles and Nashville. Presley still comes to Memphis to record and so does Johnny Cash, but recently the strongest force has been soul music. Memphis soul music is the standard mix of rhythm, blues and gospel, but the city's studio musicians add an easy, natural country feeling. The most successful record company in Memphis is Stax/Volt, founded about 10 years ago by a Tennessee farm boy, Jim Stewart. There is racial integration throughout the company, from the front office to the recording studio, where the house band, Booker T and the MGs, has two white and two black members. Until he died in an airplane crash in 1967, young Otis Redding was the major figure at Stax. The singer's records still sell steadily, along with those of other Stax performers such as Albert King, Johnnie Taylor and the Staple Singers. Recently, a young song writer named Isaac Hayes cut his first album at Stax, called "Hot Buttered Soul," and it was a best seller. If there is to be a successor to Redding at Stax, it probably will be Hayes. 40 performances, 20 clubs, 2 days, 1 woman’s dream. After just two short years, the Tel Aviv Blues Festival will kick off the New Year with its 4thedition, as Yamit Hagar satisfies our ABCs: acoustic blues cravings. Find out what drove the computer-geek-turned-blues-enthusiast to become the musical mastermind behind Israel’s one and only blues festival. hat inspired you to start this project? It began in 2012, when I invited Robert Belfour to perform at Barby. One thousand people came and another thousand wanted to, but we were sold out, so we had another show. It kept on growing from there. You mentioned Barby…do all the shows happen there? Not at all. We have shows in gardens, cafés, cinemas, houses, and clubs like Bar Giyora, Mike’s Place, Hoodna, Bascula…scattered all across Tel Aviv. How did you get into the blues? I was working in computers for eighteen years, then I heard Mississippi Fred McDowell on the radio and for that whole weekend, I was hooked. By Sunday, it was obvious what I had to do. I changed my career path right then and there. And do you play any instruments? Is this something you’d pursue someday? I don’t think so. So many people are playing the ‘right’ stuff. I wouldn’t want to interfere. So it’s more about promoting blues in Israel than playing it? That’s a must. And how about the festival planning process? Any challenges? We’re trying to do it biannually: a summer festival for electric blues and a winter festival for acoustic. The thing is, unlike jazz, which has festivals year-round, we only have one, so we can’t waste a minute. That’s why we’re already into our fourth season. What do you find the effects to be of acoustic over electric? I’m a traditionalist. If I could choose, I’d pick acoustic every time. Sometimes, I believe I was born in the wrong era, but then again, somebody has to keep two decades of music alive – Eli and the Chocolate Factory attest to this beautifully with their Louis Armstrong tribute. I believe blues traditions will never change, just like in Israel: modernists may exist, but tradition is never lost. It seems that atmosphere is key to the festival’s success too. It is. I spend the entire time hopping from garden to house party to club. Every venue is a new experience…I love it! We also give away T-shirts to wear on site. And the free shows, guitar and tickets to the Mississippi Juke Joint Festival – which I’m guilty of attending annually. What is the Israeli blues scene like in contrast? In the last few years, the vibe has changed. Some musicians are performing in Hebrew, some in English, some are playing cover songs, but in general, there is more support from the media, which helps boost the scene. And this is mostly in Tel Aviv? No, no. I know incredible blues musicians up north and down south. We simply had to find one city to bring everyone together and Tel Aviv was centrally located. How’s the local talent this year? Out of 40 shows, we’ve got 38 local musicians…so you tell me. Is there anything that sets this edition apart? The Cinematheque is hosting a film & lecture series with journalist Sharon Kantor, and will even be screening a blues reality TV show, which I’m very excited for. Come to the festival. See all the shows, explore, remember that it happens twice a year…just come. That’s all. Because once you’re exposed to live blues, there’s no going back. As the saucer skimmed through the air, Finny said, in our search for the spirit of Mississippi, we've toured a lot of Mississippi sights. I've told you many tales and legends about Mississippi. And you've learn-ed about some true 'noble crazies,'. It's all part of our unique spirit. "Now, let's take it one step further." Hover-ing over Oxford, Finny pointed to a tall, old building with a cylindrical tower. "We're on the Ole Miss campus and that's Barnard Observatory_ One of the most unique things in our state is housed there." The building looked old-timey, maybe haunted, thought Jeff, remembering Waverly. "What's in it?" he asked. "It's the Center for Southern Culture," said Finny, "Just as we're trying to understand the spirit of Mississippi, the people at the Center are trying to understand the spirit of the South. And since Mississippi is at the heart of the South, you might say their search and ours are basically for the same thing. "Of course, we are just flying over the surface of things. They, however, are digging deep into everything that is Southern and studying these Southern qualities closely. The staff at the Center does a number of projects to help us understand ourselves and to help us preserve our history and culture. They have courses, conferences and lectures about the South. Also. they write books and make records and films about the South. They are interested in the accomplishments of Southerners such as some of Mississippi's great writers and singers. And they put a particular emphasis on the accomplishments of blacks and women because sometimes they have been neglected. 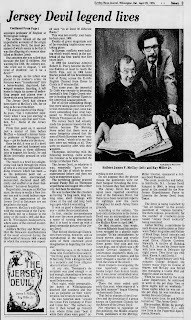 One of their current projects is a 1.000-page book called "Encyclopedia of Southern Culture It has articles on everything from Paul 'Bear' Bryant to grits and barbecue anything Southern. About 800 writers have contributed to it and it should be available in 1987. 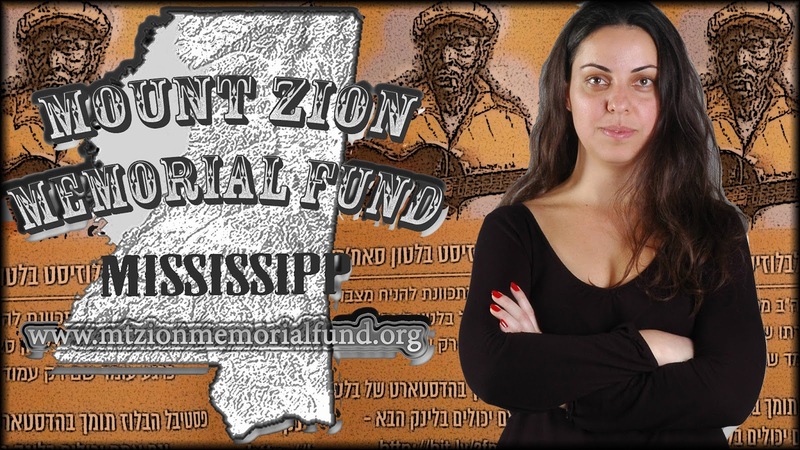 "The fact that this unique Center is located in Mississippi is another clue for us in our search. Our tremendous interest in 'what is Southern' and in our pact is part of the spirit of Mississippi It shows our pride in our heritage. " Another source of pride is the worldwide reputation which the Center of Southern Culture has. The famous composer and jazz performer Quincy Jones even visited the Center recently to do research for his musical score for the movie 'The Color Purple'. By the way, Jones is another outstanding black musician who grew up in Mississippi. "Dr. Bill Ferris, director of the Center, is known all over the world as a blues scholar. Because of its influence on so many other kinds of music, Dr. Fer-ris says blues is the single most important form of popular music America has produced. Dr. Ferris hosts a blues radio program each Saturday night at 10 on public radio, FM 90.3. His nickname is 'The Blues Doctor'," said Finny. "The show is fun as well as educational. "The Center has the largest blues music collection of records and materials in the world, including 5.000 records from blues singer B.B. King's personal collection which he generously donated to the Center. "You keep talking about blues," said Billy. 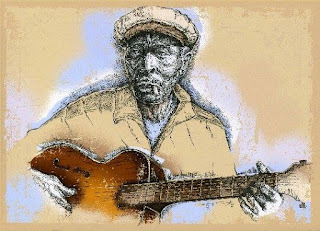 "Exactly what is the blues, anyway'"
"The blues," said Finny, "was born in the Mississippi Delta when poor black sharecroppers sang about their problems while working in the cottonfields. Blues music has a painful, hurt quality to it. It is the music of the lost, lonely and downtrodden." "Certainly it is another clue to the spirit of Mississippi that the music we gave birth to - the blues - was born by sharecropping blacks out of poverty. sadness and helplessness. It is a triumph of the spirit that some black Mississippi singers turned something bad into something good. They found their way out of their downtrodden, poor condition through their music. Blues singers like B.R. King found a silver lining with their music in the black cloud of poverty and pain. This creative music came straight from the heart. The fact it had such a tremendous impact on so much of the music world is a credit to our state. 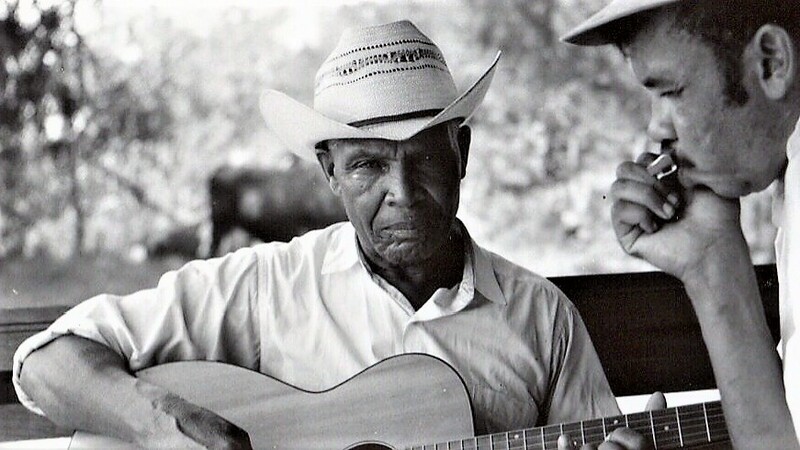 The blues is a part of our heritage we can be very proud of. even if we're not proud of the poverty and harsh conditions which helped cause it. Our state is one of the most rural. Many of its citizens have been and still are poor. It is a state which has had great dependency on cotton farming. Also it had racial problems which grew out of a segregated, agricultural society. "Singing about their troubles, often expressed in terms of 'women troubles', helped give poor Delta blacks the strength to survive. This undefeated spirit of survival in the face of great hardship is a part of the spirit of Mississippi we need to hold onto. "At one time many blacks thought blues was 'low down', that it was the devil's music'. Whites thought of it as 'cotton patch music.' But today blues music is appreciated as having had a great influence on country, rock and roll, jazz and popular music. "Mississippi is proud of its blues heritage today and finally appreciates what it gave birth to," said Finny. 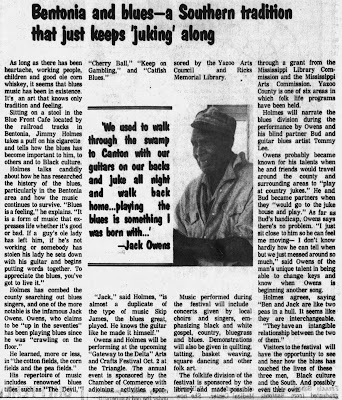 "There is a unique museum in Clarksdale, the Delta Blues Museum at the Carnegie Public Library. It helps its visitors understand what the blues is. Also, it traces the link between the blues and other forms of popular music. The Delta Blues Museum is a fun way for us to learn about this important part of our heritage. There are records, books, videotapes, photos, slide-and-sound programs and memorabilia for people to enjoy and learn from. Its director, Sid Graves, says he encourages Mississippians to visit the museum. just as visitors from Europe, other countries and other states are doing. 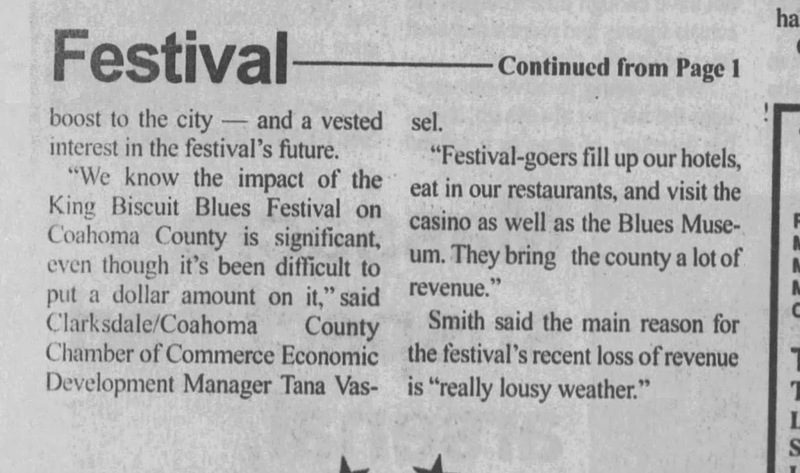 "Also, there are several blues festivals all over the state," said Finny. 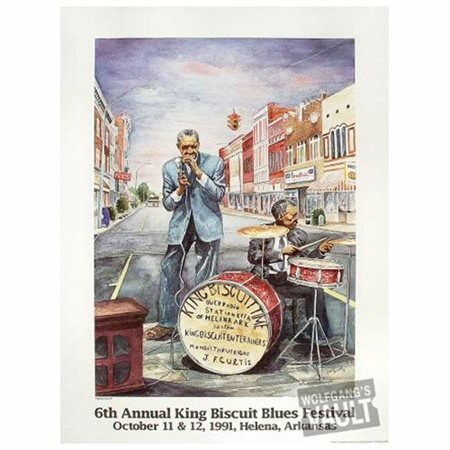 "The biggest, the Delta Blues Festival. is at Freedom Village near Greenville. Big-name blues singers and musicians come from far and wide to perform there each summer. Then there are others, such as the B.B. 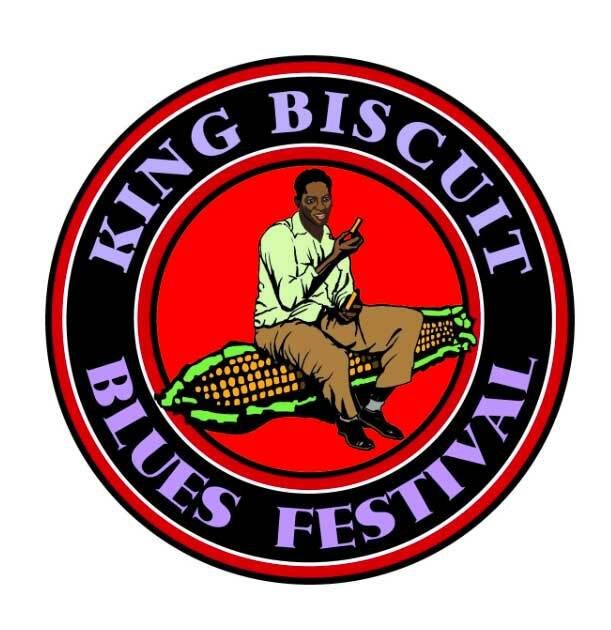 King Blues Festival in Indianola," said Finny. "You keep mentioning B.B. King. I've heard of him, but I'm not really sure who he is," said Jeff. "Well, we'll just have to go visit him then," said Finny. '•He was born Riley B. King. not B.B., in 1925 on a cotton plantation between Itta Bena and Indianola, Mississippi. Of course, he has been called by such nicknames as 'King of the Blues', 'Bossman and 'The Main Man'. When you talk about bluesmen who rose over hardships and poverty in spite of all obstacles. 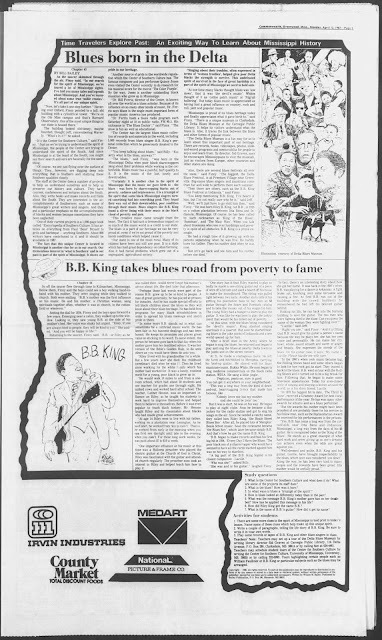 B.B King is a prime ex-ample. "He had a rough time of it growing up, with his parents separating when he was five. He hardly knew his father, Then his mother died when he was nine. "But let's go back and see him and his mother before she died." So off the saucer flew through time to Kilmachael [sic], Mississippi. Below them, Finny and the boys could see a boy walking hand-in-hand with his mother. They were singing while they walked to church. Both were smiling ''B.B. 's mother was the first influence on Pus music. He and his mother, a Christian woman, sang spirituals together often. whether it was at church, in the cottonfield or wherever." Setting the dial for 1934. Finny and the boys spun forward a few years. Emerging near a cabin, they walked up to the window. Looking in. they saw young B.B. at the side of his mother's bed. Her voice was shaky but urgent. "Riley. if you are always kind to people, they w ill be kind to you." She added. And you will be happy In life "
Returning to the saucer, Finny said, "B.B - or Riley as he was called then - would never forget his mother's advice about life She died later that afternoon. "Perhaps those last words were part of the reason B.B. grew up to be so kind to people. A man of great generosity, he has played at prisons for inmates And he has made special efforts to tell black children about the blues so they will know about their blues heritage. He has held free programs for many black schoolchildren in order to spread his blues message and instill pride in them. "In some ways B.B. stands out in what can sometimes be a cutthroat music world. He has been fair in his business dealings and has been honest He keeps his promises and places great value on sticking to his word. To some extent. the person he became goes back to that day when his mother gave bun her deathbed advice. It was her version of the Bible's Golden Rule, to do unto others as you would have them do unto you. "Riley lived with his grandmother for a while. But a few years later she died. His childhood sweetheart died when he was 11 Then he lived alone working for the white f .mils which his mother had worked for. It was a lonely, rootless world for a young, poor black to grow up in. "He would walk 10 miles to and from a one-room school, which had about 50 students and one teacher for grades one through eight. He milked cows and worked hard after school. The teacher. Luther Henson. was an important influence on Riley, as he taught his students to work hard to improve themselves and helped them to believe in themselves. Before it was ever popular to teach black history. Mr. Henson taught Riley and his classmates about blacks who had made great achievements. At age 14 Riley went to live with his father, working on a plantation near Lexington. As he said later, he worked from 'kin to caint.' That is. he worked from early in the morning when you can first see daylight until late in the evening when you can't. For these long work weeks. he was paid about $7 to $10 a week. "One important influence on his music at this time was a Holiness preacher who played the electric guitar at the Church of God in Christ. Riley was fascinated with the guitar and attended church regularly The preacher soon took an interest in Riley and helped teach him how to play it. "One story has it that Riley wanted to play so badly he made a one-string guitar .out of a piece of wire off a broom and used a board off his house to make the soundboard. The string was pulled tight between two nails. 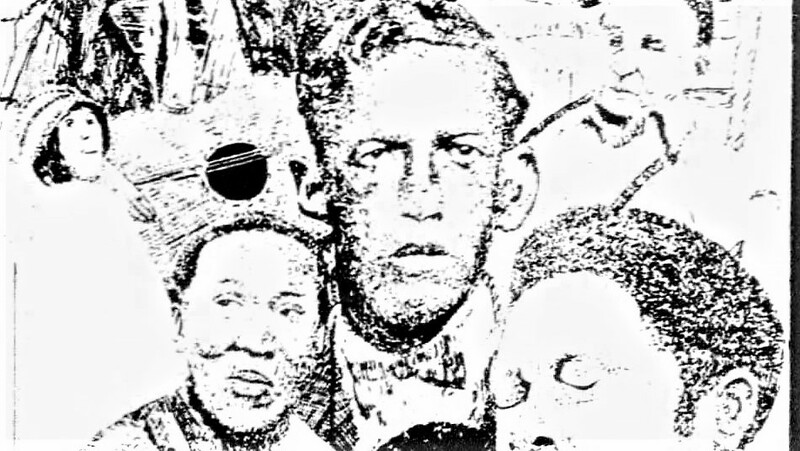 Another story tells of his getting his plantation boss to buy him an $8 guitar through the Sears and Roebuck catalog and to take the money out of his wages for him. The young Riley had a hunger to learn to play the guitar. It was like he was born to play the instrument that would be his ticket out of poverty. "At this time. with the blues being considered the 'devil's music'. King started singing spirituals in a quartet. But soon he started hearing blues in the juke joints of Indianola and a new world opened up for him. 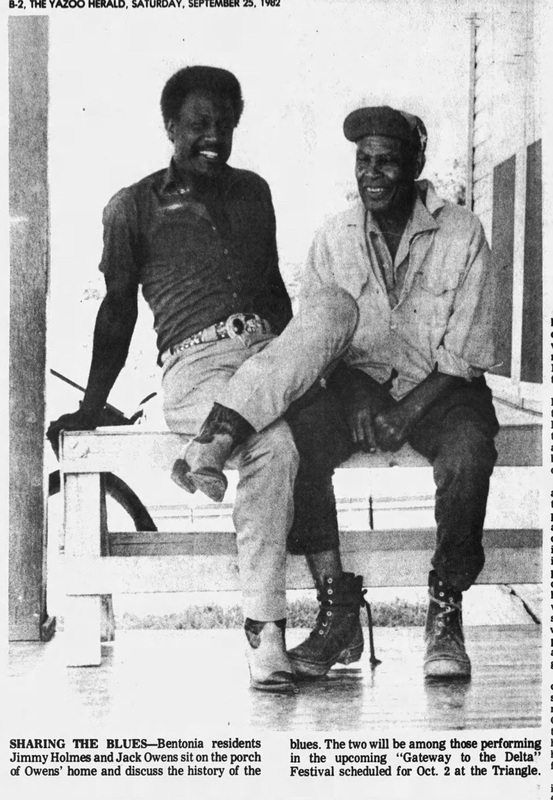 "After a brief stint in the Army where he began to sing the blues, he returned and began to play and sing the blues at nearby Delta towns in the joints and on the street corners. Pepticon, pepticon, sure is good. But it was a start, he was on his way. He began to play at night clubs. Soon he became a disc jockey for the radio station and got to sing his songs on the air. Since he needed a catchy name. 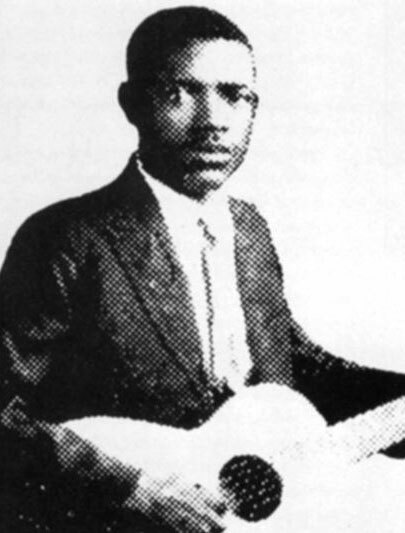 they called him Riley King, 'the Beale Street Blues Boy'. After all, he played lots of Memphis' Beale Street music. Soon the nickname became 'the Blues Boy', which later became simply B.B. And that's how he got the name B.B. King. "B.B. 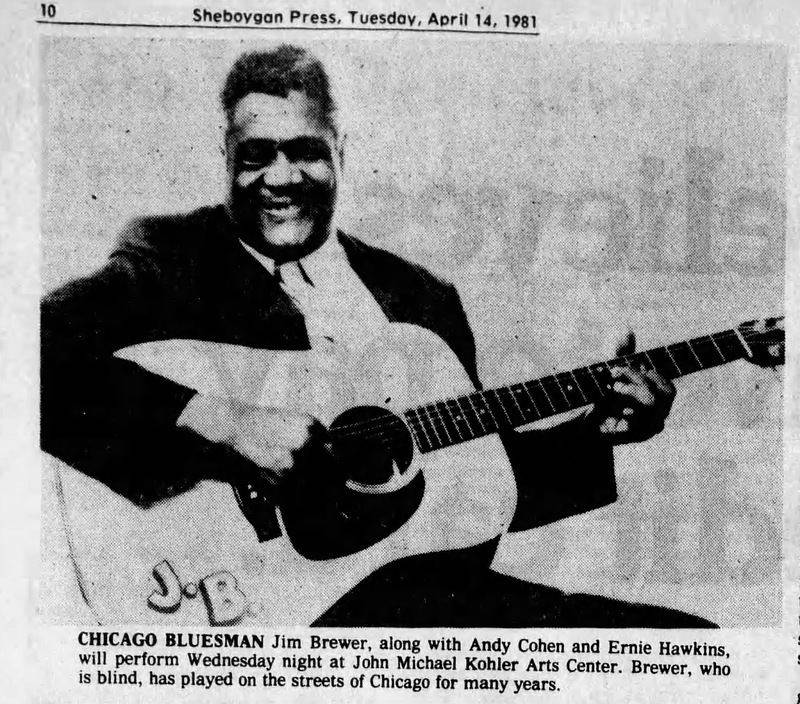 began to make records and had his first big hit in 1954, 'Every Day I Have the Blues.' The poor black son of a sharecropper who would have seemed to have all the cards stacked against him was on his way to stardom. "A big part of the B.B. King legend is his closest companion - Lucille." "Who was she?" asked Billy. "She was and is his guitar," laughed Finny. "In fact. there's an interesting story about how she got her name. It was back in the 1950's when B.B. was playing for a dance in Arkansas. A fight broke out, knocking over some kerosene and causing a fire. At first B.B. ran out of the building with the crowd. Suddenly he remembered he had left his beloved guitar behind. Risking his life, he ran back into the burning building to save the guitar. The two men who were fighting died in the blaze. Can you guess the name of the woman they were fighting over'!" "Right you are," said Finny. "And it is fitting that B.B. would give his guitar a person's name because the way he plays her, she has her own voice and personality. He can make her cry, howl, whine, sound smooth and sweet or angry and brassy. She expresses the moods of the blues On his guitar case, it says. 'My name is Lucille. Please handle me with care. "In the 1960's when rock music became big, the Rolling Stones band and some others began to look for how rock got its start. They traced it back to the blues. B.B. went on tour with the Rolling Stones and it turned out to be a big break for him. Following that. he began to make some television appearances. Today his eyes-closed style of singing and playing is known around the world. as is his shiny friend, Lucille. In 1970 his biggest hit to date, 'The Thrill Is Gone', received a Grammy Award for best vocal performance of the year. He has won many other awards for albums and as a blues performer. "But the awards his mother might have been proudest of are probably those for his service to his fellow man, such as the Humanitarian Award he received for his performances in the prisons. "Yes, B.B. has come a long way from the cottonfields near Itta Bena and Indianola, Mississippi, a long way from the days of his $8 guitar. He is recognized today as the 'King of the Blues'. He stands as a great example of what hard work and never giving up on one's dreams can achieve even when the odds are great against you. "Well-dressed and polite. B.B. 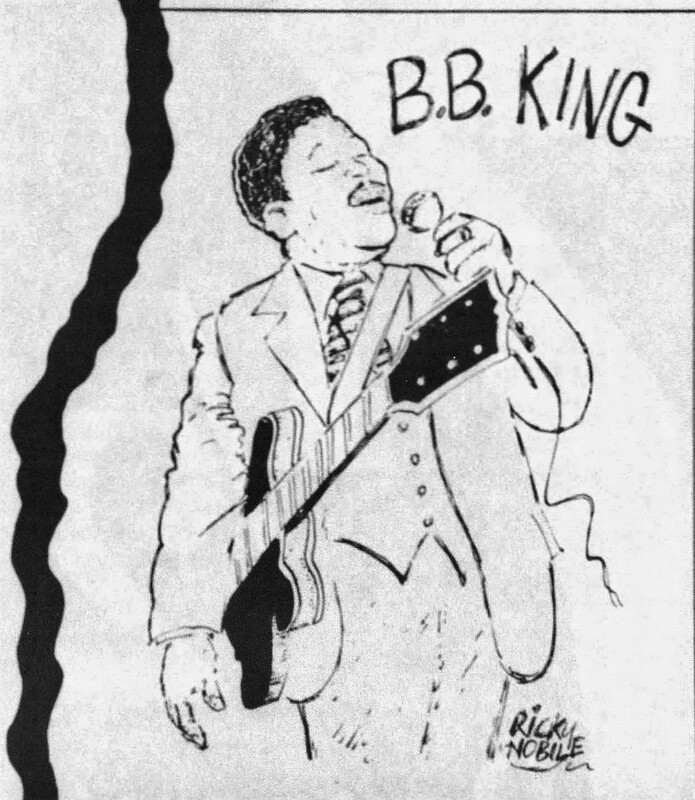 King and his guitar, Lucille, have brought respectability to the blues, which once was considered 'low down'. Along the way, he has been very kind to many people and the rewards have been great. His mother would be awfully proud." 1. What is the Center for Southern Culture and what does it do? What are some of the projects its staff does? 2. What is the blues? How was it born? 3. In what ways is blues a 'triumph of the spirit'? 4. How is blues looked at differently today than in the past? 5. What was the message B.B. King's mother gave him on her death-bed? How has he applied this message in his life? 6. How did Riley King get the name B.B.? 7. What is the name of B.B. 's guitar? How did it get its name? 1. There are some more clues to the spirit of Mississippi in bold print in today's lesson. Name some of these clues which help make up this unique spirit. 2. Write a couple of paragraphs, telling the life story of B.B. King. Be sure to write it in your own words. 3. Play some records or tapes of B.B. King and other blues singers in class.